I visited this property a few years back on one of my several Napa Valley voyages and instantly fell in love with the place because of the beautiful Sequoia Trees and cabin-style tasting room. What's perhaps even better is that their wine is usually equally impressive. I remember being quite taken with their 2004 Reserve Cabernet Sauvignon. 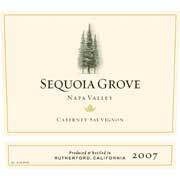 The 2007 Napa Cabernet is unique in that it's the first vintage they decided to use some of their coveted Tonella fruit (50 acre Rutherford Estate) in the blend. Here's a list of some of the growers they use to source the rest of the fruit from: Stagecoach, Morisoli, Lamoreaux, Boeschen, Beckstoffer, Cunat, Healy, Johnson, Madrigal, and Harris. The color of this wine is deep and dark at the core of the glass and then the edges of the glass turn to a lighter, but still deep ruby red hue. Texture-wise the wine seems to look quite sleek, almost like a classic left-bank Bordeaux.